Throngs of Blackhawks fans of all ages crowded the intersection of Wacker Drive and Michigan Avenue on Friday to celebrate a Stanley Cup victory with their Chicago Blackhawks. Toews and his teammates soaked up every second of the good feelings, slowly riding into the Loop aboard double-decker buses, hoisting the Stanley Cup for all to see. Owner Rocky Wirtz promised more Championships to come. "The Stanley Cup is here to stay," Wirtz said before thanking the crowd that city officials put at roughly two million people. 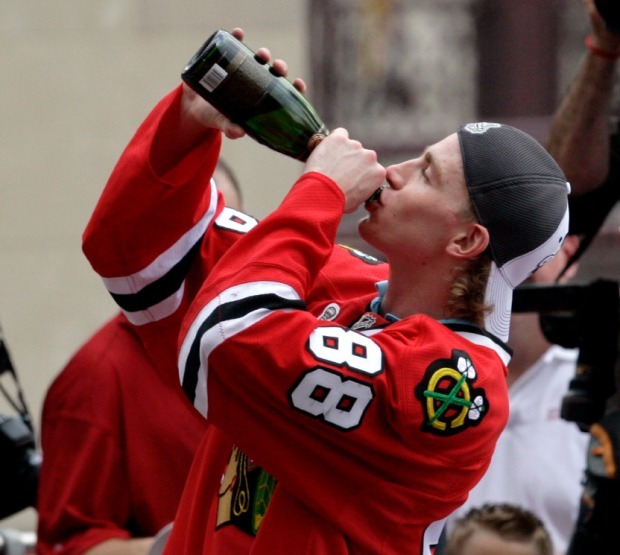 Patrick Kane slammed beers and sent a shout out to all the cab drivers of the world. "I'll tell you one thing, I'm gonna try and keep my shirt on all summer...for all the cab drivers out there. I love ya,” Kane said, referring to his Buffalo arrest last year. We love you, Kane. Go Blackhawks! Dustin Byfuglien waved his WWF-style belt, Chris Versteeg belted out tunes and Duncan Keith flashed a gummy smile. "Best time of my life right now,” Keith said. “Who knows a good dentist?" But as much fun as the players were having, the fans -- who braved stifling heat -- were having more. 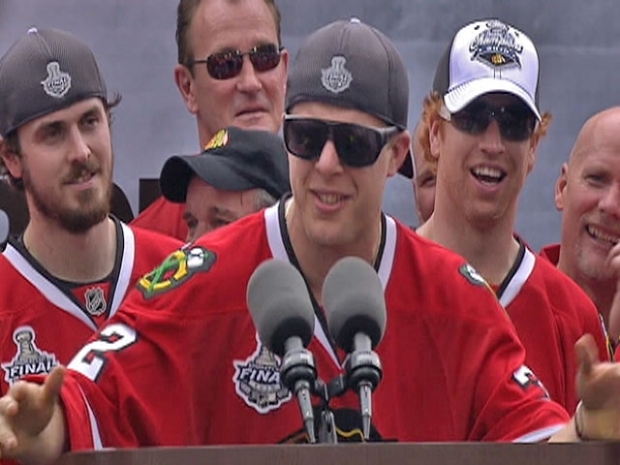 Blackhawks left winger busts out an original rhyme during Stanley Cup celebration. "I cried like a little girl when they won,” said Adam Zirba, who’s been growing a playoff beard since the preseason. “I'm going to get as crazy as they'll let us." Some die-hards began lining the parade route before the sun came up, and by 7 a.m. Michigan Avenue was packed with hockey revelers. “This is awesome. This is unbelievable. Greatest day in my whole life,” said one fan who showed off a tattoo he had on his back that depicted the Stanley Cup. Reed Montague had been in the hospital since Monday with a severe respiratory infection, but begged the doctors to discharge him for the parade. He got out at 8 a.m. and was at the parade by 9 a.m. It was a dangerous move. The heat and humidity sent at least 50 people to the hospital, and cops said people were "dropping like flies." 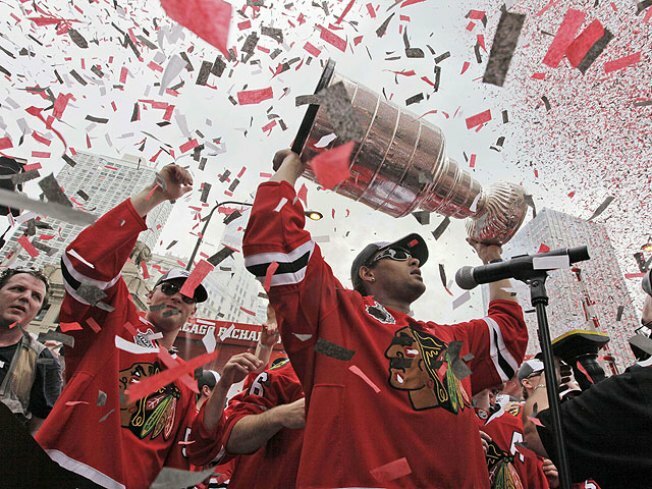 The festivities wrapped up just before 1 p.m. as the Blackhawks reboarded the buses that brought them downtown and slowly drove away, holding the Stanley Cup above their heads.